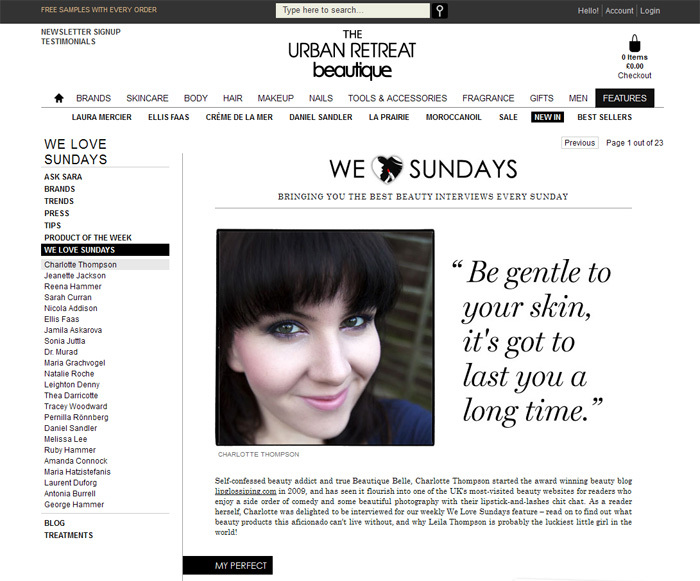 This weekend, I had the pleasure of being interviewed for The Urban Retreat Beautique’s We ❤ Sundays feature. A weekly installment that offers up a dose of informal chit-chat with beauty contributors from around the globe. If the alternative is doing some proper work on a Tuesday morning, I invite you to click through to discover some useless knowledge about me such as: what’s in my handbag, the last three things I whacked on my debit card and even my favourite day of the week. If the alternative is making love to a hot, hot man (it is Valentine’s Day afterall), you’re forgiven… move along. Just click and read later yeah? I’m sorry, what was that? I couldn’t hear you over the sound of my fangirl screaming. ;o) Lovely interview, my dear!